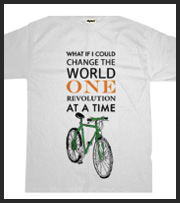 Cycling tee shirts for smart riders. 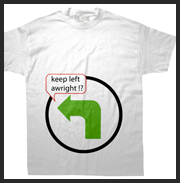 Folk who love to ride their bikes and have a sense of humour too. 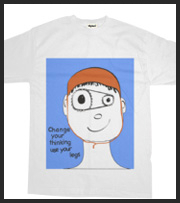 Original T-shirts designed by Saren Dobkins, they are eye-catching, different and made to last. 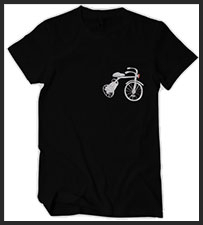 As an artist, designer and cyclist I wanted to create T-shirts that revolve around the changing mindset of people who see the value and joy of riding their bikes. I'd love to hear from you and welcome your comments. 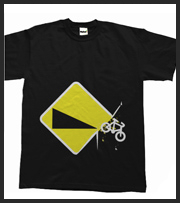 Below are a selection of shirts available from Bikepath. 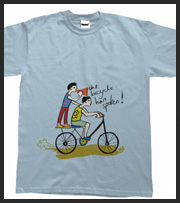 See the whole collection by clicking on Bike Tees. Try Cycling? I'll try anything! A little reminder that I'll try anything. As long as it gets me somewhere. 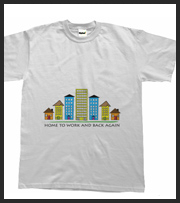 Click here to order your T Shirt. Join in on what else bikepath is doing.